So, to be clear, you are actually saying that CA should retcon the lore because you think it's offensive to the history of Spain. Do I have that correct? I'm implicating that my idea that the developers of the lore has not any idea of the history of Estalia was not absurd taking into consideration those other slips of the warhammer lore. No idea of the history of Estalia? Do you mean the history of Spain? The history of Estalia is whatever they wrote. 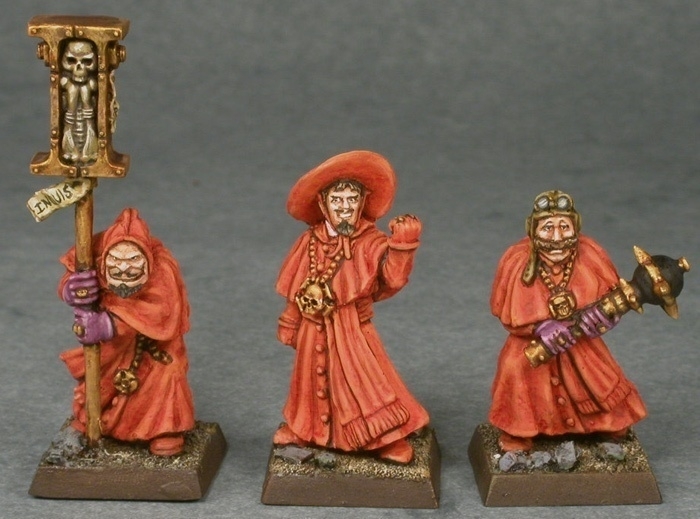 If Nigel, Rick or Tuomas had wanted to produce a Spanish faction for Warhammer they'd have done so and the history would be more what you'd want it to be. That was never the intent, though. Just like Chaos Dwarfs weren't meant to be real Assyrians in their culture or history and Tomb Kings aren't real Egyptians. Stillman also wrote the foundational lore for those factions and given that he's a trained Egyptologist and a keen Assyriologist I am absolutely certain he could have been closer to historical fact if he'd fancied it with those two. If the lore gets too close to history then it really does run the risk of causing offense. Luckily, Warhammer lore never does come that close and people understand it's not meant to. There's the loosest possible link to "real" history. So Estalia was conquered by the evil Sultan of Araby (also highly offensive, if we are to believe this is the view Warhammer's writers took of the Moors - luckily it isn't) and then had to be freed by a Crusade. That's not a big deal. The Empire would have been wiped off the map if Teclis hadn't helped them out. Surely that's worse, being saved by one elf. I'd say that you're okay if you're conquered by a massive invasion that requires the entire might of the Old World to free you. If your issue can be solved by Benedict Cucumbersandwich in a frock, that's embarrassing. I have already say to you I have never get offended. I have never protest anything by here. Never try to stop buying their products because of these or anything like this. Did you understand what i mean? But I have always think is improvable. Tomb kings are not Egypt, but they are cool anyway. Estalians are not Spanish, but they are there withouth reason. Just to be there. They are not cool. Not even in a single moment of their history. They absolutely deletable. Nobody will notice. And yes. I wanted to mean Spain where I said Estalian. Honestly, I always had the impression that the Estalians were just as involved in the Crusades, possibly more so, than the Brets and the Empire. The latter just supplied a ton of heavy cavalry. 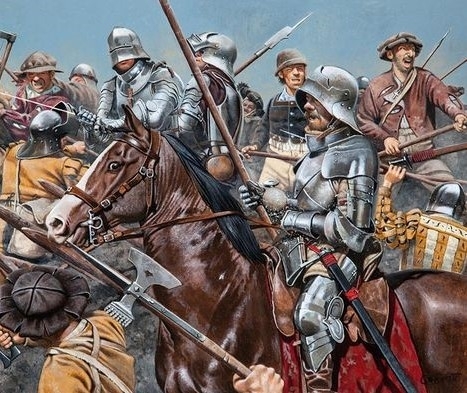 Most of the poor bleedin' infantry, and some of that heavy cavalry as well, would likely have been Estalian. We just hear about the Brets and Empire knights because the books were written from their perspective. Heck, in the Empire book the Crusades pretty much only exist as the backstory for a couple of Knightly Orders. In a long away used Spanish, as the root of the language is latin, yes. But we call "villano" the bad guys of films, literally means: evil. For example, Thanos is the "villano" of Avengers. I think they were going for "hombres malos" initially, but went with "hombres villanos" so English-speakers would get the Spaghetti Western reference of "bad hombres." You have to remember this stuff is coming alongside minis like "The Dwarf with no name"....it's all popular movie references from the 60s and 70s. This was before "bad hombres" became dog whistle politics code. There are a huge number of Spaghetti Western references in GW stuff from the 70s and 80s. Holy crap, I did NOT expect this thread to blow up into a debate. Maybe it's time to call for backup. In my opinion, it would be cool if Estalia has not access to any kind of mage because of the inquisition. And because if anyone is suspected to use magic he or she would be accussed and burned alive. But unfortunately for you, for me, for the world and the universe, I'm not the creator of the Lore, so "hombres villanos bandoLLeros" is cannon. Take the F.U.C.K unit seriously, we take it seriously, it doesn't matter the meaning, etc. etc. Sure, but the thinking "could" have been that it wasn't supposed to be a modern Spanish, but an old form, where "men from the village" makes sense. It's an unfortunate choice nonetheless, though. It's also, incidentally, old enough that it's questionable if it really is still canon. I don't think anyone would bat an eyebrow if it does get changed. Mind you, the odds of Estalia getting its own army list at all rather than being rolled into a Southern Realms list is pretty slim. I DID say that those last two units were from 3rd edition amd thus aren't canon anymore. I even said it in bold text. I only included them as a joke (since yes, their names are silly) and to show that Warhammer actually had statted Estalian units at one point. Plus, those units were from the Old Worlder mercenary company list. So even if they were canon, we could just assume that they represent the seedier side of Estalian soldiery, which is the impression I got from them anyway, and aren't indicative of the race as a whole. I'm also against changing Estalia's existing lore to make it more closely resemble Spain's because ESTALIA ISN'T SPAIN. It's clearly based on Spain, and it borrows liberally from Spanish history, geography, and stereotypes, but it isn't actually Spain. Thus, the writers are free to change things up and diffetentiate Warhammer from our world. They made Tobaro and the eastern lands of the Old World's southwestern peninsula part of Tilea because they could and they gave good reasons for it. They gave Estalian Tercios glaives because they could and they wanted to differentiate them from Tilea's pikemen. At this point, I'm going to ask that if you want to continue this debate, please take it to another thread and post a link to it in here. This thread is supposed to be focused on Estalia's canon units, and while I don't mind sidetracking (heck, I'm very guilty of it myself), I think this has gone on long enough, and I don't see an end in sight. I actually would like to se hombres villanos, bandolleros gringos and other units with those silly names, and i'm Spanish. #MakeDwarfsGreatAgain Josef Bugman, Thorek Ironbrow, Alrik Ranulfsson, Grimm Burloksson, Kazador, Malakai Makaisson, Gotrek Gurnisson, Dragon/Deamon slayer, Zeppelin, Shieldbearer mount, Master brewer, Goblin-Hewer, Norse dwarf war mammoth, proper Anvil of Doom, Ulther's dragon company, Lond drong's slayer pirates, Everguard. Those all missing things are grudges in the great book, is in your hand to settle them, CA. Khazukan kazakit-ha! Also that you want to conclude your treat with your position looks a bit harsh. Okey. Thanks for sharing it, but is one more opinion between others. As far a I'm concern I want to see what are you going to talk here about, and feel free to share my opinion without any other restriction but to respect the rules of the forum. A great picture of a (very wealthy) knight from the late Middle Ages/early Renaissance, and a good idea for plate armor that looks different from the Empire's Gothic style. That's all the lore says about them. So, we know that these Estalian Knights were brave, though that goes for most of the knights of the Old World, and they probably wore plate armor like Imperial Knights, though we don't know if Estalian plate is as good as Imperial plate. 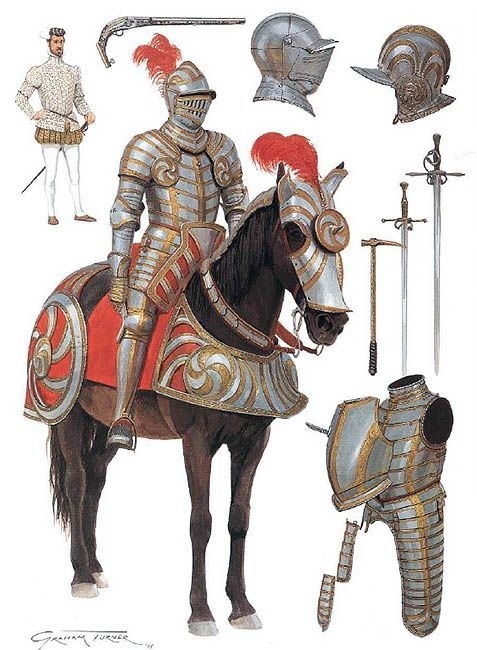 More Renaissance cavalry in plate armor, but with unarmored horses this time. That's pretty much it for Estalian Knights. Moving on. No GW images, so have some grim-looking horsemen with lots of black to fit their whole Cult-of-Morr-heretics theme. Honestly, there's nothing explicitly tying the Mortaria to Estalia except that they marched alongside Larhgoz, but since that's where their only mention in the lore is from, I decided to include them. Plus, in case you didn't notice, Estalia needs all the units it can get! Beggars can't be choosers. It's also not clear if these guys would work better as heroes or as a cavalry unit. They're outcasts from the Cult of Morr, so they should know some prayers, and their chanting in battle could be interpreted as them casting battle prayers. On the other hand, they were grouped up when Tazadis nuked them, which makes them sound more like a unit than special characters. 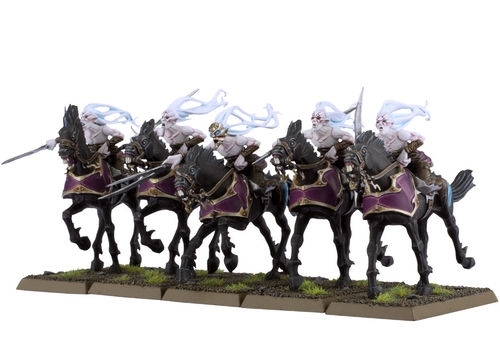 And it's not like magical horsemen with casting or casting-like abilities units don't exist in Warhammer: Just look at the Dark Elves' Doomfire Warlocks. So there's good precedent for adding a unit like the Mortaria could be if they aren't made into heroes. Oh, and to answer everyone's question: No, we don't know what the Mortaria's "nightmarish heresy" was. I've already given you every piece of info we have about them. That's it for canon Estalian cavalry. But there's one more unit I should mention before we end this part. They're an Imperial unit, but some people believe they should be available to Estalia. I disagree, but they should be touched on nonetheless. 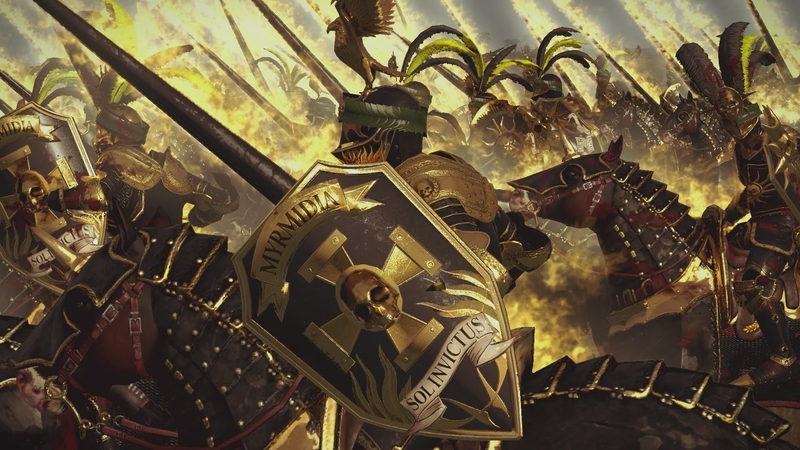 For those who don't know, the Knights of the Blazing Sun are an Imperial knightly order that looks to the Tilean and Estalian warrior goddess Myrmidia as their patron, rather than a more Imperial deity like Sigmar or Ulric. This is because the Blazing Suns trace their order's history back to the crusades against Araby. In 1448 IC, roughly 1050 years before Total War: Warhammer begins, Sultan Jaffar of Araby invaded Estalia with a massive army. After getting their butts kicked and being almost completely conquered, the Estalians asked the other Old World nations for help. 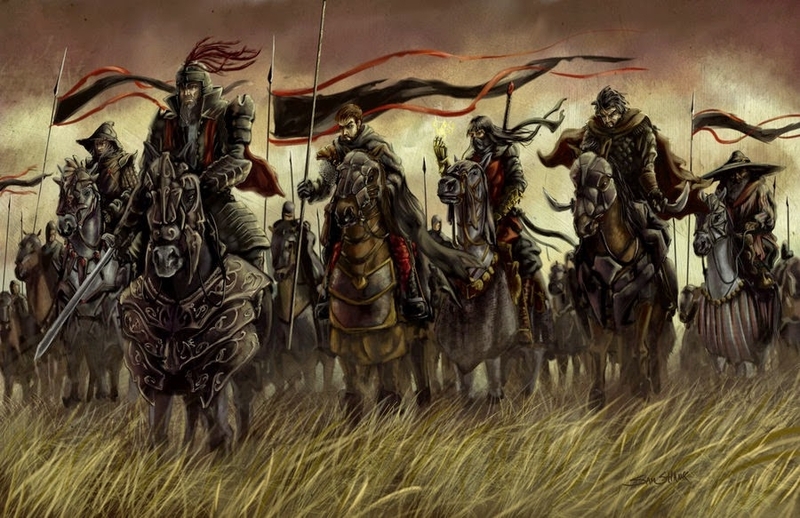 Bretonnians, Tileans, and most of the Empire's knights answered the Estalians' pleas, and vast armies marched into Estalia to meet Jaffar's forces. During the fierce fighting around the city's temple to Myrmidia, a group of Imperial knights were ambushed by the elite warriors of Emir Wasr the Cruel. As the Arabyans closed in for the kill, an earthquake shook the temple and a huge bronze statue of the goddess plummeted to the street, crushing Wasr and his troops. Seeing this as a sign from the heavens, the knights rallied and drove their enemies from the field. Shortly thereafter, the surviving knights established the Order of the Blazing Sun with Myrmidia as its patron. Upon returning to the Empire, the Blazing Suns built a shrine to Myrmidia in the heart of Talabheim. There they made their headquarters, and today they are one of the largest and most influential orders in the Empire, on par with the Knights Panther and Knights of the White Wolf. Though many Imperial folk mistrust them for courting a strange foreign goddess, the Blazing Suns care not. They've fought with distinction against the Empire's foes for over a thousand years, and they're held as prized allies by many Elector Counts. 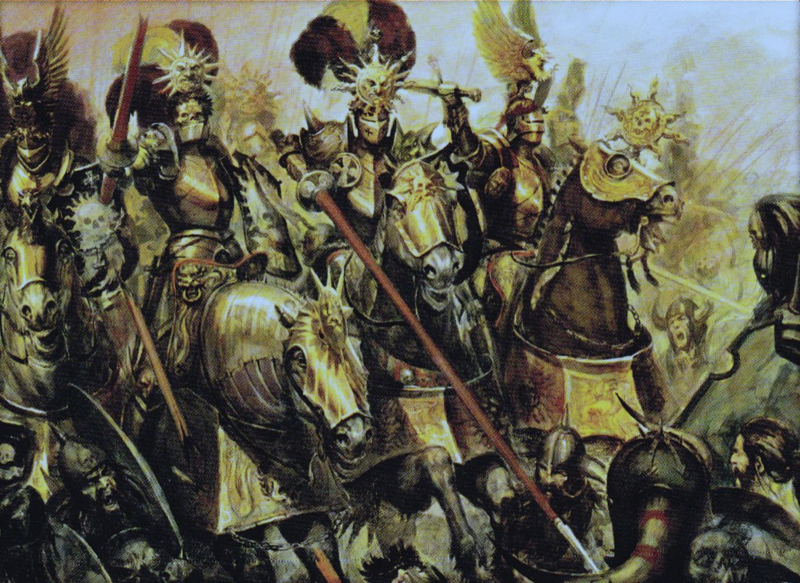 On the tabletop in 8th edition, these guys were just generic Empire Knights like all the other Knightly Orders. In Total War: Warhammer, they have magical glowing lances and are more special than even the Reiksguard. Funny how things work out, ain't it? Based on this background, some people have thought that Estalia should have Knights of the Blazing Sun. After all, they ARE a Myrmidia-worshipping order, and they WERE founded in Estalia during the Crusades as a result of the Battle of Magritta. So surely they could be a unit for Estalia, right? The Knights of the Blazing Sun are all Imperials. Even though they worship Myrmidia, the Blazing Suns are still a knightly order of the Empire. They recruit from the Imperial nobility (probably from provinces like Reikland where Myrmidia has gained some local popularity) and they fight for the Empire and its people. I haven't found any canon sources saying that the Blazing Suns have chapter houses in Estalia or fight in Estalian armies. Knowing this, it would be very weird to see the Blazing Suns fighting for Estalia when the Empire is so far away, and I'm 100% certain that in any conflict between Estalia and the Empire, they would either side with the Empire or refuse to fight at all (which is within their right as a knightly order). Besides local petty wars, there's no way they would ever turn their lances on the Empire unless the circumstances were extreme, like having a Chaos-worshipping emperor or something. 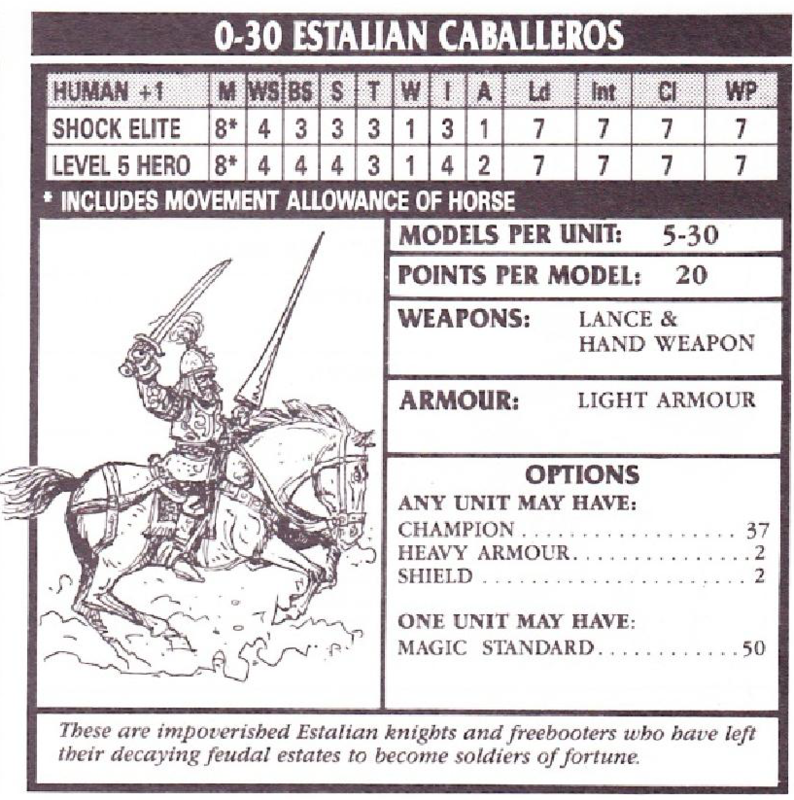 So, no, I don't consider the Knights of the Blazing Sun to be a reasonable inclusion for an Estalian unit roster. And just like that, we're done with Estalia's cavalry, and done until the next update. I'm sorry I couldn't do the rest of Estalia tonight like I said I would, but I've been busy with work and I have some more sources I want to dig through before I write up the last part. But wait! What's that? Why, it looks like it's another retconned unit from 3rd edition! !Buenas noches y hasta pronto, amigos! Once again, sorry for the shorter update tonight, but I hope you enjoyed it regardless. For units, I may have missed them but you seem to have missed out hill-fighters and marines, which are mentioned in 3rd edition as forming significant parts of the forces of the mountain and coastal kingdoms respectively. Some of the kingdoms were also explicitly named, in the third edition rulebook and then in a couple of WD articles from the period. Can't recall any of them off the top of my head, though, and I don't have my 3rd edition books to hand. 3rd edition isn't canon, and I'm trying to stick to canon (hence the title), so I'm not using its units for more than jokes so far. I still have a bunch of White Dwarf issues to go through. I might bring them up at the end as things that could be resurrected and used, tgough. It is for areas that aren't further explored in the lore. Numerous campaign books, FW projects and WD articles have made use of 3rd edition fluff (and earlier). Unless it's been explicitly retconned, then it is entirely usable by CA. The whole idea of "canon" in Warhammer is a nonsense anyway, but a lot of the third edition stuff on Estalia stands, as it hasn't been replaced. They're in the game because GW said it was okay. GW can totally bring back things from 1st-3rd editions, but unless they do the info presented in them isn't canon. There's just too many things that have been retconned, changed, and dropped from those editions (like the Pygmies less-than-flattering traits; GW never replaced their 3rd edition info with anything, but I'd be shocked if they were still canon). If GW makes Estalia's 3rd edition lore canon, awesome. I'd totally support that. But until they do, I won't consider its units eligible for this thread, which is meant to be about the units that we know for sure are canon. If you want a list with the older stuff, check out PaulH's impressive work on twcenter. But that's beyond this thread's scope. What do you mean by "GW make it canon"? The canon is just what GW has written. 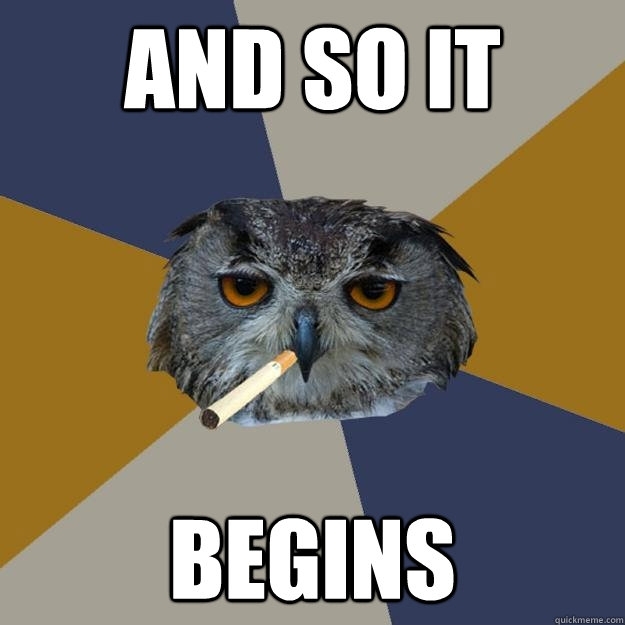 and not declared void. 3rd edition was never declared void by GW, ever. They just built over a lot of it in later editions. The Warhammer stuff from 3rd that wasn't replaced is entirely fine to refer to and it happens rather a lot. The only concerns GW ever had with old stuff was that they went through a stupid phase of not letting their old minis be used in GW stores. It was an "unofficial" policy for a while and thankfully they're moving away from it. I understand that viewpoint, and to some extent I wish I agreed with it, since I completely support expanding and adding to the lore. But I've already decided that I'm not using 1st-3rd editions for these lists. There's just way too much in the early editions that's wildly inconsistent with 4th edition onwards for me to ever be able to say with confidence that anything from them is currently canon, including the stuff that wasn't ever replaced by anything in later lore like Pygmies and Nipponese Suicide Bombers. I'll occasionally point out tidbits and things that could be easily resurrected to flesh out the races I cover, and I might include other stuff as part of a joke, but I won't include them in the main list of canon units except in very unique circumstances (ex. Arabyan Dervishes being mentioned in canon but only having a description in 2nd edition). These threads I make are meant to focus only on material and units that I know for sure are currently canon and thus part of the Warhammer world. If I'm not sure if it's currently canon, I might still mention it, but I'm not including it in the unit list. I've already done this with Araby, and I intend to maintain those standards in this and any more threads I make. If you disagree, that's fine, and I can't say that you're necessarily wrong. I'm just trying to be as objective as I can when deciding what's definitely canon and what isn't. Besides, there are already several good lists for pretty much all the minor races out there that include the early editions, RPGs, and more. Simply recreating those lists would be pretty pointless, so I'm being more selective in what I include. But if that more inclusive style is more to your taste, awesome. More power to you. That seems fine to me. If you have a particular idea of what makes something "canon" and are applying it to your thinking, that seems reasonable. I've no issue with the thread at all, I was just confused as to what issue you saw with the stuff from 3rd. Awesome why is it just now that I see this thread. Excellent. When will you be doing the next one?